Check this out, I pulled out my wheelchair lift and converted the door into a deck that drops out like a drawbridge. 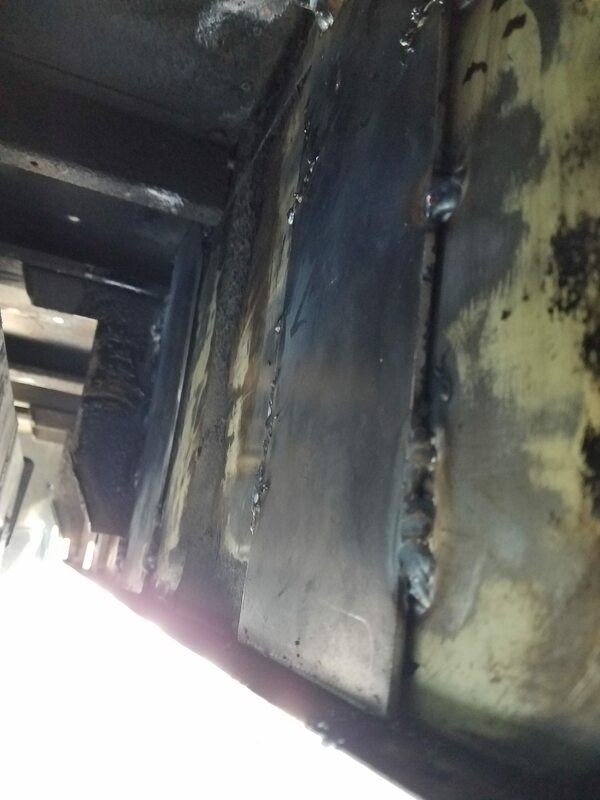 I had a welder fabricate the steel, but designed and built the rest of it myself. 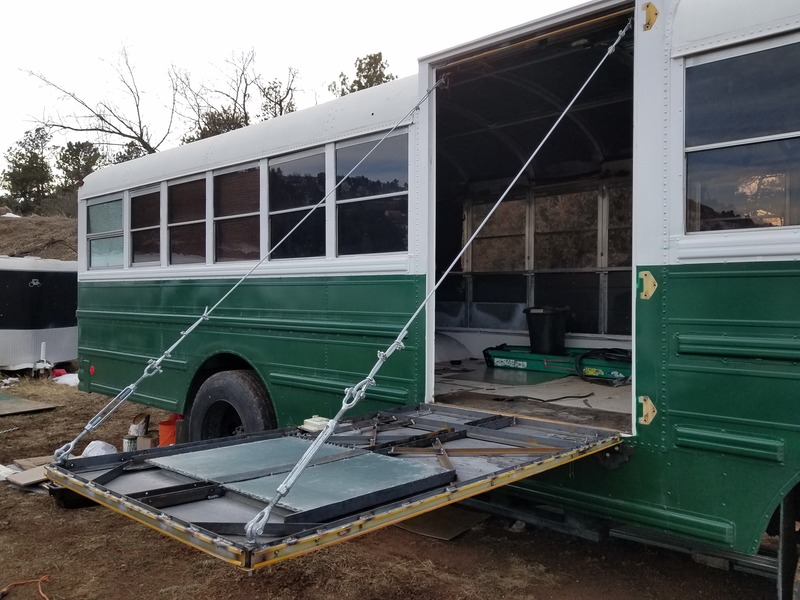 First, we had to reinforce the side of the bus, under the floor, to support the relocated hinges. 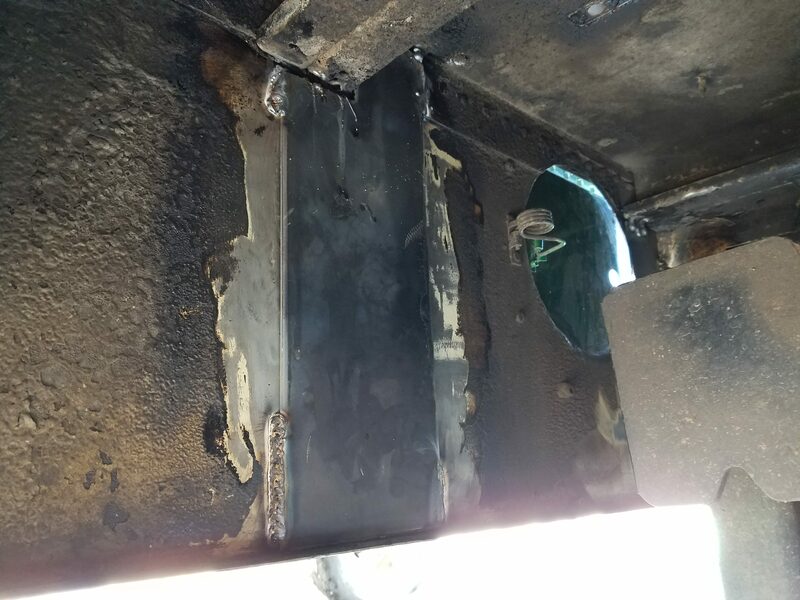 Plates were cut to fit around the floor rails then welded into place. 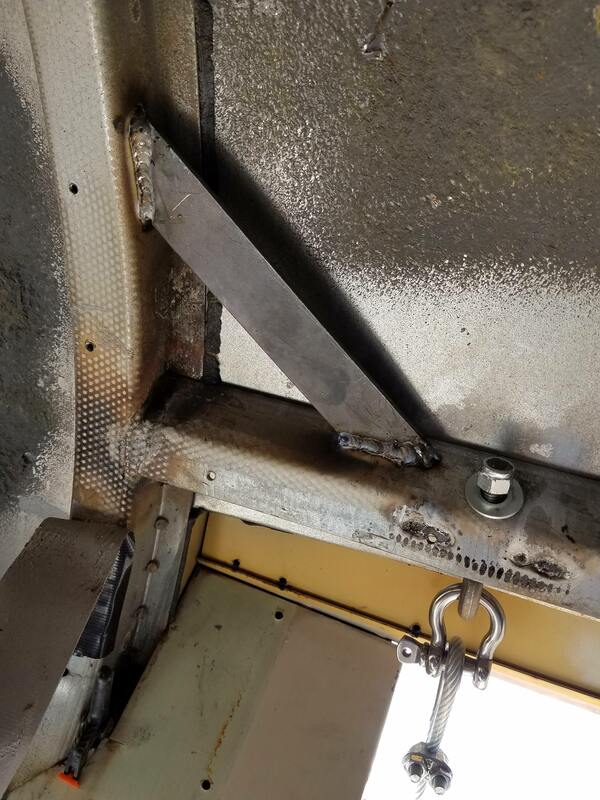 On the outside, we cut steel washer plates that are sandwiched between the hinge and the bus skin. 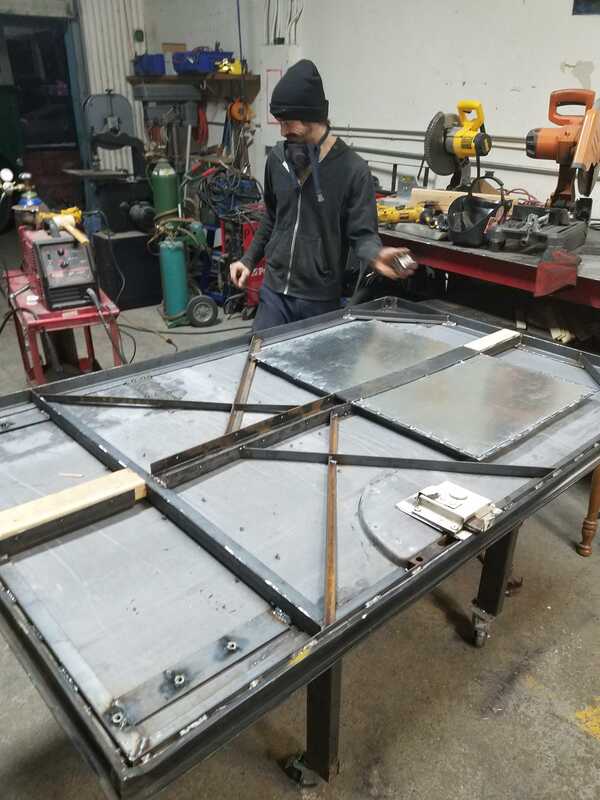 I cut the skin off the inside of the door so we could reframe it with angle iron. In hindsight we really should have just built a whole new door. Squaring and flattening the old door and working around the existing lock was an incredible PITA. You can see some of the 2x4 framing we were dry-fitting. I forgot to snap a picture of that step completed. We used 2x4's and cut them to fit all the spaces between the steel, then used a table saw to shave them down to the proper height. Setting the door in place so it would articulate correctly took some time. 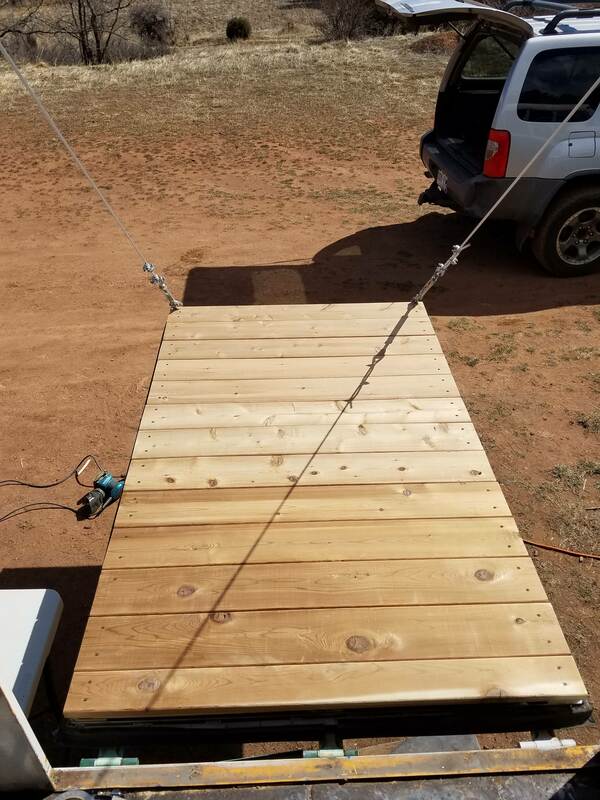 We used steel cable and turnbuckles to suspend the deck. 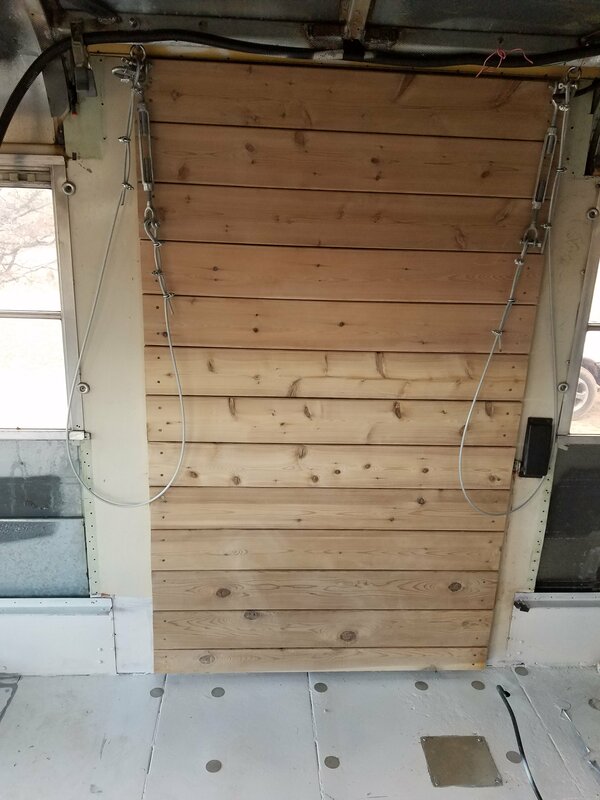 I used drywall shims to level the 5/8" plywood platform. The door weighs about 225 so it's a little hard to lift closed. I'm going to install a winch in the top corner with a wireless remote so I can drop the deck out all slick-like. The weakest piece of gear (being the cable) is rated to 880lbs (each). I think the deck or hinges would bend before the gear fails though. We put 500lbs on it and it still seemed really solid. The plan is to not only be my personal little patio, but a pop up sound-stage for festivals and the burn. 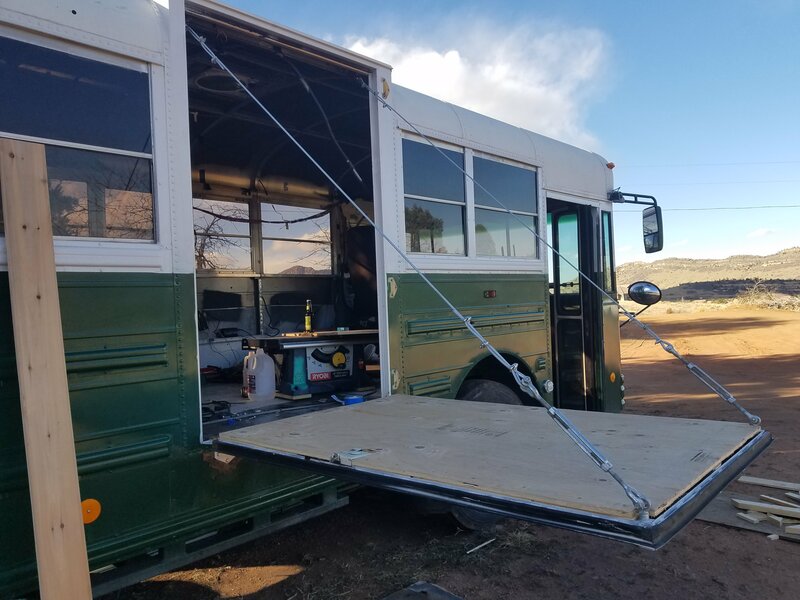 My first event is Apogaea (Colorado's regional burn) where the bus will be debued as a 3000w sound camp. Well...there's a first! Excellent stage/patio! 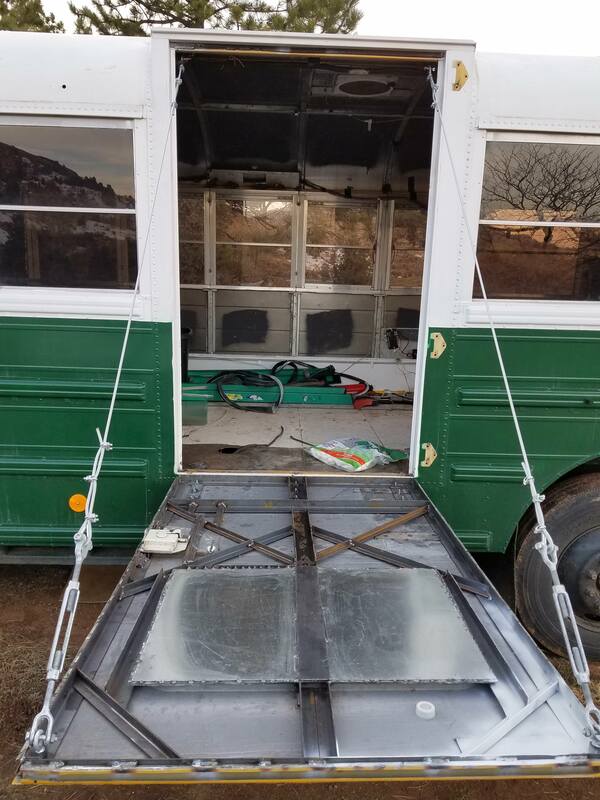 Check this out, I pulled out my wheelchair lift and converted the door into a deck that drops out like a drawbridge. I really like the idea, and it definitely looks strong enough for your purpose.....good job. And if you keep a cutlass stored beside it, you could use it as a gangplank to rid yourself of unruly visitors. Very nice. I know that feeling in the end of,..should have done it differently....but you did it and it is done. Did you reuse the safety interlock because this could get ugly if it is not secured properly. 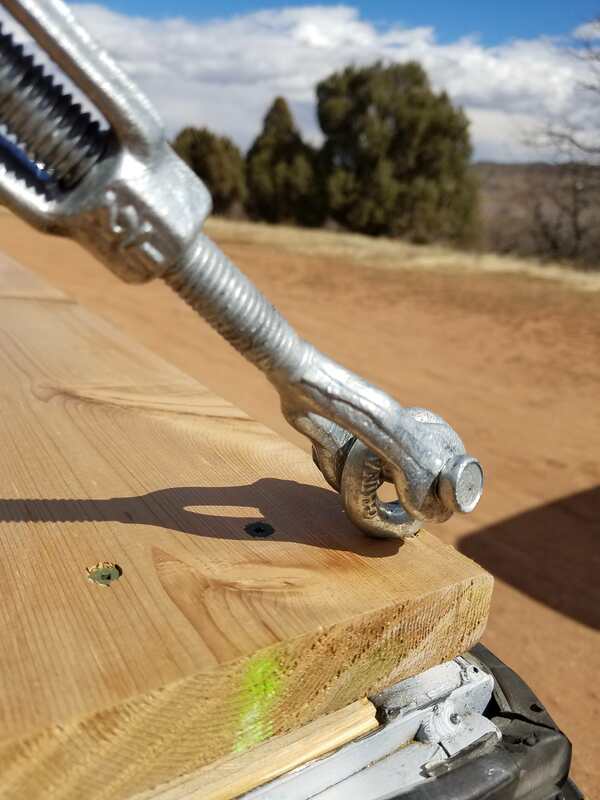 The eye-bolts are rated for inline pull only. The way you used it on the stage they have a large angle resulting in bending forces in the threaded area. May be OK ? 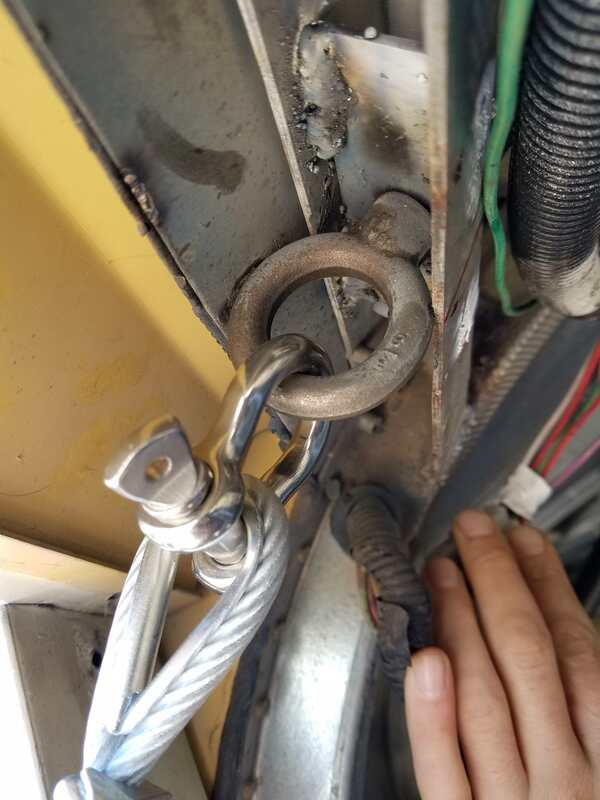 From a another safety aspect,.. if you use these atv winches and weld the cable release shut, so that the cable can not un-spool, and use one on each side so you have back up if one has a failure. You can also use a garage door torque spring to take some of the load off. Good advice all around. The eyebolts are supported at the top of the frame and the bottom, So I hope to reduce the side-stress on the bolt. I looked for some kind of bracket with a pin or bolt, but couldn't find one. As for the winch, what do you think of this? It has a mechanical load-holding brake and power in / power out. I plan to leave one cable hard-rigged and one on the winch, so the deck will flex but not drop it it fails.